Polypharmacy is described as taking five or more medications daily. One survey found that more than 50% of female Medicare beneficiaries took five or more medications daily, with 12% taking 10 or more medications daily. 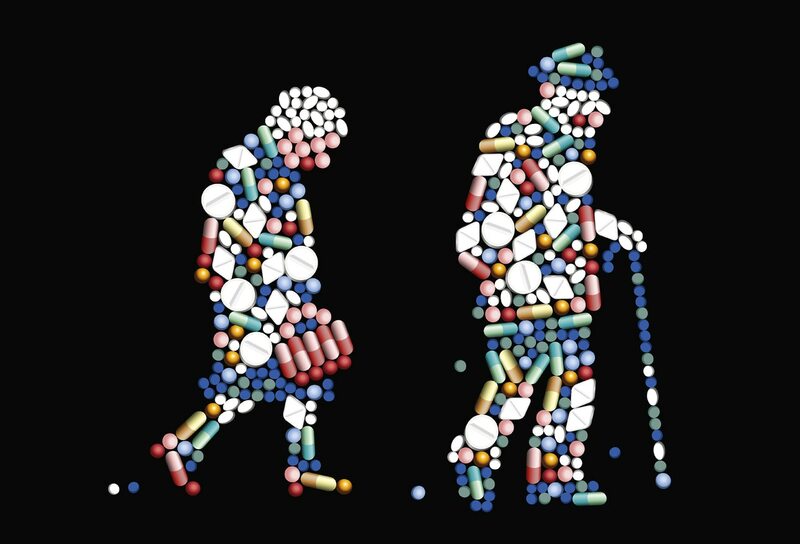 Overprescribing in the elderly is concerning. A study found that prevalence of polypharmacy increased from 17.8% to 60.4% in patients ≥ 65 years between 1997 and 2012. Many of the drugs mentioned in this slideshow are on the American Geriatrics Society Beers Criteria® list (currently under review) as potentially inappropriate medications. There is no evidence that docusate (Colace®) is effective for what it is used for—softening the stool or preventing constipation. In a randomized controlled trial, 170 adults with chronic constipation received either 5.1 g psyllium or 100 mg docusate twice daily. Psyllium was safe and superior in its effect on stool frequency, stool water content, total stool output, and the combination of several objective measures of constipation. Compared with baseline, psyllium increased stool water content by 2.33% vs .01% for docusate (P = .007), and stool weight was increased in the group treated with psyllium (359.9 g weekly vs 271.9 g weekly from docusate-treated patients; P = .005). A study conducted in cancer patients compared those treated with a combination of the stimulant laxative sennosides and docusate to those treated with docusate alone. Patients were followed for almost 500 days. The senna-only group had more frequent bowel movements, with no difference in amount of reported cramping compared with the group taking the combination. Docusate probably continues to be overused and is a contributor to polypharmacy. A cohort study found that one third of patients admitted to an internal medicine floor who were not taking docusate at the time of admission were discharged with a docusate prescription. Following changes to the antibiotic prophylaxis guidelines for prevention of endocarditis in 1997, clinicians should be prescribing far fewer antibiotics as prophylaxis before dental cleanings or procedures. Many patients are still receiving antibiotic prophylaxis before dental procedures because they have prosthetic joints, even though there is no evidence to support this practice, and the most recent American Academy of Orthopaedic Surgeons (AAOS) and the American Dental Association (ADA) recommendations do not encourage it; the organizations have developed joint Appropriate Use Criteria for this population. In 2015, the ADA guidelines specifically recommend against this practice. This advice may not apply to transplant patients, and the decision to premedicate for invasive dental procedures and selection of the appropriate regimen should be made on a case-by-case basis. Among the potential problems associated with proton pump inhibitors (PPIs) are reduced absorption of calcium (with increased fracture risk), B12, and thyroid hormone absorption, acute and chronic kidney injury, and increased risk for Clostridium difficile infection. Mortality may also be increased in PPI users. Some patients do need PPIs long-term (eg, refractory reflux disease, scleroderma-related reflux, and elderly patients on chronic nonsteroidal anti-inflammatory drug therapy). However, many other patients are prescribed PPIs. They are often prescribed for stress ulcer prophylaxis in hospitalized patients but aren't needed after discharge. Another common use of PPIs is for abdominal pain without a recognized source; in this situation, it makes sense to try taking the patient off of the PPI. The data on the benefits versus harms of deprescribing PPIs are inconclusive. A Cochrane review found that deprescribing PPIs can increase gastrointestinal symptoms while reducing pill burden. Evidence-based guidelines are available to help you deprescribe PPIs. With the release of the American Heart Association guidelines for statin use in 2013, there has been a significant increase in the use of statins for primary prevention, but there is a paucity of evidence on the benefits of statins for primary prevention in patients over the age of 75 years. [16,17] A large observational study conducted in patients over the age of 75 found no benefit in atherosclerotic cardiovascular disease (CVD) or all-cause mortality in nondiabetic adults aged 75 and older. Even for those with diabetes, there was no benefit found in patients over the age of 85. The Choosing Wisely campaign has issued a statement on statins in those over age 75, saying there is "no clear evidence that high cholesterol leads to heart disease or death" in this population, and that some studies show that people with the lowest levels of cholesterol have the highest risk for death. Statins can be associated with muscle symptoms and can interact with several drugs, increasing toxicity in elderly patients. There is a difference in the potential benefits of statins for secondary (after cardiovascular event or stroke) versus primary prevention. The risks versus benefits of primary prevention is a particular concern in patients over the age of 80. Insomnia, a common concern in older patients, is often managed pharmacologically, but the chronic use of benzodiazepines and the "Z drugs"—zolpidem, zaleplon, and eszopiclone—should be avoided. In elderly patients, the risk of stacking of side effects and risks is very real. Many elderly patients are on selective serotonin reuptake inhibitors (SSRIs) and may also be taking a benzodiazepine to treat the insomnia caused by the SSRI. All three of these drug groups—benzodiazepines, SSRIs, and Z drugs—raise the risk for falls in the elderly. In addition, benzodiazepine use has been linked to an increased risk for Alzheimer disease (AD), making judicious prescribing even more important. When prescribing benzodiazepines, it's helpful to "start with the end in mind" to ensure short-term use. Evidence-based guidelines are available to help you deprescribe benzodiazepines. In the 2011 American Heart Association/American College of Cardiology Foundation guidelines, beta-blocker use was recommended for 3 years after either a myocardial infarction (MI) or acute coronary syndrome (ACS) in all patients with preserved left ventricular function (class I recommendation, grade B evidence). As a class IIa recommendation, the guidelines stated that it was reasonable to continue beta-blocker therapy beyond 3 years in patients with a history of MI or ACS. More recent data have not shown long-term mortality benefit with prolonged beta-blocker use and call into question the immediate benefit of beta-blockers after MI or ACS in an era when reperfusion therapies are common. [20,21] Furthermore, beta-blockers are not very potent antihypertensive agents and are less effective than other options for the treatment of hypertension in the elderly. Atenolol is particularly ineffective for prevention of negative outcomes from hypertension. Many patients with shortness of breath are diagnosed with asthma or chronic obstructive pulmonary disease (COPD), and when their symptoms do not resolve, more drugs and higher doses are prescribed. In a recent study, one third of patients with a current diagnosis of asthma had normal respiratory tests (spirometry/peak flow) and had no problems with weaning off of asthma medications. The same high rate of incorrect asthma diagnosis has been shown in several other studies over the past few years. [25,26] The major culprit in misdiagnosis was not using spirometry to make the diagnosis. This is a good area in which to practice deprescribing. Some patients with asthma or COPD are misdiagnosed, others may not have active asthma, and medications could be weaned. The antimuscarinic agents (darifenacin, fesoterodine, oxybutynin, solifenacin, tolterodine, and trospium) used commonly for the treatment of stress urinary incontinence have a small benefit. These drugs have strong anticholinergic properties and can cause major side effects, especially in elderly populations; the Beers criteria describes this class of drugs as potentially inappropriate for use in the elderly. For example, oxybutynin resolved urinary incontinence in 114 of 1000 treated patients, while 63 of 1000 stopped treatment because of side effects. This is another drug class with very modest benefit and many disconcerting side effects. The number needed to treat for any benefit in patients with dementia for donepezil (the most commonly prescribed anticholinesterase inhibitor) is 12. This means that for every patient who obtains a modest benefit from this drug, 11 will be treated but have no benefit. The side effects are disturbing with this class of drugs and include nausea, decreased appetite, weight loss, syncope, and urinary incontinence. [30,31] Some patients may even be started on an antimuscarinic agent for the urinary incontinence caused by the anticholinesterase inhibitor they are taking. Evidence-based guidelines are available to help you deprescribe cholinesterase inhibitors and memantine. The evidence of benefit is insufficient for the use of muscle relaxants for the treatment of subacute or chronic low back pain. This class of medications produces a great deal of side effects and is especially dangerous in the elderly, as evidenced by its categorization as potentially inappropriate in the Beers criteria. Toxicity is increased when combined with alcohol. Many patients take over-the-counter supplements. In fact, many doctors and nurses take—and recommend—supplements. Taking supplemental vitamins is particularly common, although no benefit has been shown in cardiovascular disease or, in the case of vitamin D, cancer prevention. Calcium supplements are also unlikely to benefit postmenopausal women. In the largest study to date, calcium and vitamin D supplementation slightly increased bone density and frequency of kidney stones but did not reduce fracture risk. Calcium supplementation does inhibit thyroid hormone absorption. New guidelines make it easier to decide when to stop a PPI. But first we need to put the risks associated with this class of drugs into perspective. Common Prescribing Blunders: Are You Making Any of These? Disclosure: Douglas S. Paauw, MD, has disclosed no relevant financial relationships. Gnjidic D, Hilmer SN, Blyth FM, et al. Polypharmacy cutoff and outcomes: five or more medicines were used to identify community-dwelling older men at risk of different adverse outcomes. J Clin Epidemiol. 2012;65:989-995. Kaufman DW, Kelly JP, Rosenberg L, Anderson TE, Mitchell AA. Recent patterns of medication use in the ambulatory adult population of the United States: the Slone survey. JAMA. 2002;287:337-344. Moriarity F, Hardy C, Bennett K, Smith SM, Fahey T. Trends and interaction of polypharmacy and potentially inappropriate prescribing in primary care over 15 years in Ireland: a repeated cross-sectional study. BMJ Open. 2015;5:e008656. McRorie JW, Daggy BP, Morel JG, Diersing PS, Miner PB, Robinson M. Psyllium is superior to docusate sodium for treatment of chronic constipation. Aliment Pharmacol Ther. 1998;12:491-917. Hawley PH, Byeon JJ. A comparison of sennosides-based bowel protocols with and without docusate in hospitalized patients with cancer. J Palliat Med. 2008;11:575-581. MacMillan TE, Kamali R, Cavalcanti RB. Missed Opportunity to Deprescribe: Docusate for Constipation in Medical Inpatients. Am J Med. 2016;129:1001.e1-7. Dajani AS, Taubert KA, Wilson W, et al. Prevention of bacterial endocarditis: recommendations by the American Heart Association. Clin Infect Dis. 1997;25:1448-1458. Berbari EF, Osmon DR, Carr A, et al. Dental procedures as risk factors for prosthetic hip or knee infection: a hospital-based prospective case-control study. Clin Infect Dis. 2010;50:8-16. Hamedani S. A clinical practice update on the latest AAOS/ADA guideline (December 2012) on prevention of orthopaedic implant infection in dental patients. J Dentistry. 2013;14:49-52. Quinn RH, Murray JN, Pezold R, Sevarino KS; Members of the Writing and Voting Panels of the AUC for the Management of Patients with Orthopaedic Implants Undergoing Dental Procedures. The American Academy of Orthopaedic Surgeons Appropriate Use Criteria for the Management of Patients with Orthopaedic Implants Undergoing Dental Procedures. J Bone Joint Surg Am. 2017;99:161-163. Kao FC, Hsu YC, Chen WH, Lin JN, Lo YY, Tu YK. Prosthetic joint infection following invasive dental procedures and antibiotic prophylaxis in patients with hip or knee arthroplasty. Infect Control Hosp Epidemiol. 2017;38:154-161. National Institute of Dental and Craniofacial Research. Dental Management of the Organ or Stem Cell Transplant Patient. https://www.nidcr.nih.gov/sites/default/files/2017-09/dental-management-organ-stem-cell-transplant.pdf Accessed August 23, 2017. Xie Y, Bowe B, Li T, Xian H, Yan Y, Al-Aly Z. Risk of death among users of proton pump inhibitors: a longitudinal observational cohort study of United States veterans. BMJ Open. 2017;7:e015735. Boghossian TA, Rashid FJ, Thompson W, et al. Deprescribing versus continuation of chronic proton pump inhibitor use in adults. Cochrane Database Syst Rev. 2017;3:CD011969. Stone NJ, Robinson JG, Lichtenstein AH, et al. 2013 ACC/AHA guideline on the treatment of blood cholesterol to reduce atherosclerotic cardiovascular risk in adults: a report of the American College of Cardiology/American Heart Association Task Force on Practice Guidelines. J Am Coll Cardiol. 2014;63(25 Pt B):2889-2934. Han BH, Sutin D, Williamson JD, et al; ALLHAT Collaborative Research Group. Effect of statin treatment vs usual care on primary cardiovascular prevention among older adults: the ALLHAT-LLT randomized clinical trial. JAMA Intern Med. 2017;177:955-965. Ridker PM, Lonn E, Paynter NP, Glynn R, Yusuf S. Primary prevention with statin therapy in the elderly: new meta-analyses from the contemporary JUPITER and HOPE-3 randomized trials. Circulation. 2017;135:1979-1981. Park H, Satoh H, Miki A, Urushihara H, Sawada Y. Medications associated with falls in older people: systematic review of publications from a recent 5-year period. Eur J Clin Pharmacol. 2015;71:1429-1440. Smith SC Jr, Benjamin EJ, Bonow RO, et al. AHA/ACCF secondary prevention and risk reduction therapy for patients with coronary and other atherosclerotic vascular disease: 2011 update: a guideline from the American Heart Association and American College of Cardiology Foundation endorsed by the World Heart Federation and the Preventive Cardiovascular Nurses Association. J Am Coll Cardiol. 2011;58:2432-2446. Dondo TB, Hall M, West RM, et al. Beta-blockers and mortality after acute myocardial infarction in patients without heart failure or ventricular dysfunction. J Am Coll Cardiol. 2017;69:2710-2720. Bangalore S, Makani H, Radford M, et al. Clinical outcomes with β-blockers for myocardial infarction: a meta-analysis of randomized trials. Am J Med. 2014;127:939-853. Testa G, Cacciatore F, Della-Morte D, et al. Atenolol use is associated with long-term mortality in community-dwelling older adults with hypertension. Geriatr Gerontol Int. 2014;14:153-158. Carlberg B, Samuelsson O, Lindholm LH. Atenolol in hypertension: is it a wise choice? Lancet. 2004;364:1684-1689. Aaron SD, Vandemheen KL, FitzGerald JM, et al. Reevaluation of diagnosis in adults with physician-diagnosed asthma. JAMA. 2017;317:269-279. Heffler E, Pizzimenti S, Guida G, Bucca C, Rolla G. Prevalence of over-/misdiagnosis of asthma in patients referred to an allergy clinic. J Asthma. 2015;52:931-934. Jain VV, Allison DR, Andrews S, Mejia J, Mills PK, Peterson MW. Misdiagnosis among frequent exacerbators of clinically diagnosed asthma and COPD in absence of confirmation of airflow obstruction. Lung. 2015;193:505-512. Shamliyan T, Wyman JF, Ramakrishnan R, Sainfort F, Kane RL Benefits and harms of pharmacologic treatment for urinary incontinence in women: a systematic review. Ann Intern Med. 2012;156:861. Agency for Healthcare Research and Quality. Nonsurgical treatments for urinary incontinence in adult women: diagnosis and comparative effectiveness. Comparative Effectiveness Review No. 36. April, 2012. http://www.pcori.org/sites/default/files/PCORI-Executive-Summary-NonSurgical-Treatment-of-Urinary-Incontinence-120716.pdf Accessed August 14, 2017. Kaduszkiewicz H, Zimmermann T, Beck-Bornholdt HP, van den Bussche H. Cholinesterase inhibitors for patients with Alzheimer's disease: systematic review of randomized clinical trials. BMJ. 2005;331:321-327. Sheffrin M, Miao Y, Boscardin WJ, Steinman MA. Weight loss associated with cholinesterase inhibitors in individuals with dementia in a national healthcare system. J Am Geriatr Soc. 2015;63:1512-1518. Starr JM. Cholinesterase inhibitor treatment and urinary incontinence in Alzheimer's'disease. J Am Geriatr Soc. 2007;55:800-801.
van Tulder MW, Touray T, Furlan AD, Solway S, Bouter LM, Cochrane Back Review Group. Muscle relaxants for nonspecific low back pain: a systematic review within the framework of the Cochrane collaboration. Spine (Phila Pa 1976). 2003;28:1978-1992. Dickinson A, Boyon N, Shao A. Physicians and nurses use and recommend dietary supplements: report of a survey. Nutr J. 2009;8:29. Fortmann SP, Burda BU, Senger CA, Lin JS, Whitlock EP. Vitamin and mineral supplements in the primary prevention of cardiovascular disease and cancer: an updated systematic evidence review for the U.S. Preventive Services Task Force. Ann Intern Med. 2013;159:824-834. Jackson RD, LaCroix AZ, Gass M, et al. Calcium plus vitamin D supplementation and the risk of fractures. N Engl J Med. 2006;354:669-683.